CIOs who aren't learning what their customers want risk losing focus as they augment their business with digital capabilities. CEOs are seeking to generate more revenues from their emerging digital businesses, forcing CIOs to become more familiar with their company's customers. Digital agendas are devouring CIOs' attention and forcing them to partner with the CEO and the CMO. The trend represents a sea change of sorts for the CIO, whose role evolved sharply from that of a custodian of back-office systems to a curator of customers. 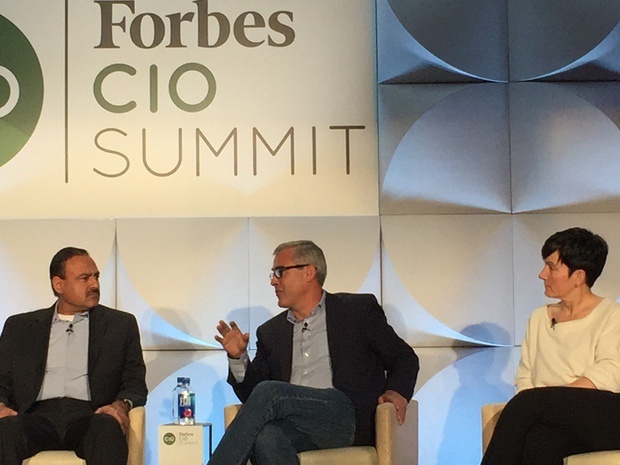 Three CIOs who manage technology for global businesses discussed what that evolution means in the context of their businesses at the Forbes CIO Summit in Half Moon Bay on Monday. Left to right: Roger Gurnani, chief information and technology architect at Verizon; Mike McNamara, Target CIO; Stephanie von Friedeburg, CIO of World Bank. As one of the founding officers of Verizon Wireless, Roger Gurnani has watched the telecommunications market evolve. But perhaps nothing is more challenging for Gurnani than his current role as chief information and technology architect, positions that combine the roles of CTO and CIO. He's managing wireless network and telecom network architectures, as well as the IT and digital technologies that orchestrate business processes. "We felt it was important to create the new role that bridges business technology and strategy," Gurnani says. Verizon's strategy is predicated on the fact that its customers are consuming an array of digital services, including watching video from smartphones and tablets, and connecting home appliances to the Internet. Gurnani is overseeing the construction of the company's IoT network, ThingSpace, which relies heavily on machine learning algorithms and data analytics to automate Verizon's networks, as well as an ecosystem of applications, sensors and mobile devices connected to it. "The entire value chain is becoming programmable ... it's becoming software driven," Gurnani says. "Business models are disrupting and changing because it's no longer humans that have to make decisions. With deep learning and different algorithms, [everything] is getting so automated." Verizon uses data coming out its automated systems to better serve its 125 million consumers and 200,000 corporate customers. For example, Verizon routs its 35,000 field service technicians using algorithms to analyze customer service needs and direct to people's homes the techs with the appropriate skills and the trucks with the right spare parts to remediate a problem to people's homes. "Our technology focus is centered around the customers," Gurnani says. "We measure the success in terms of customer satisfaction and it all happens in close to real time." Measuring customer satisfaction is also a major focus at retailers such as Target, where Mike McNamara became the permanent CIO eight months ago. McNamara is improving core operations, including augmenting Target's supply chain applications, in the wake of one of the most devastating data breaches in U.S. history. He called mobile technology perhaps the most disruptive force to Target, whose popular Cartwheel app allows its loyalty card holders to hunt for discounts from their smartphones. But McNamara says he gained customer insights during his stint as CIO of U.K. grocer Tesco, where he spent time in every position in the retailer's stores. He worked as a cashier and call center representative, an experience he described as humbling. "You go from feeling like you're the master of the universe to feeling like an imbecile," McNamara says, of taking customer calls. Despite the wealth of data analytics piping customer insights into today's businesses, working the store floor is the only way to grasp how the business operates as well as how the decisions a CIO makes impact the lives of employees and customers. "What doesn't flow through the bits and bytes is customer emotion ... how customers feel about the brand and their experiences," McNamara says. "To get in tune with that customer, you've got to get out there." World Bank CIO Stephanie von Friedeburg has become an advisor to the broader business for the nonprofit organization, which offers financing and other programs to help governments alleviate poverty. With the support of President Jim Yong Kim, von Friedeburg reorganized IT to better serve customers in 186 countries. She centralized IT by replacing widely dispersed on-premises hardware and software with social, mobile, analytics and cloud solutions, including public cloud services from Box, Microsoft and AWS, and expanded the bank’s Internet connectivity. Such technologies have laid the foundation for extending technology outside the office to serve its government customers. For example, World Bank lends money to governments to maintain roads. But figuring out where that maintenance ought to occur is challenging. So the bank is equipping cars with sensors to determine where road decay and congestion are greatest, which will tell them where the funding is getting spent. "We can disperse our money using sensor data and actually become more effective and efficient," von Friedeburg says.